Then again let me come to my post. In this post, we will learn how to increase traffic to your blog through Facebook. If you just started your blog and you want to bring traffic to your blog, then Facebook can be the best choice for it. The first thing you need to do is create your facebook fan page. People will be able to follow your blog via facebook page and whenever you share your new post on your page, they will be immediately reaching out to your page. The people in the post urged to share that post. When they share your post, the post will go to their friends so that your blog will get more traffic. ❤Invite your friends to your page. ❤When your friend likes your page, its notification will go to his friends as well. There will be a possibility of getting more likes from you. ❤Facebook like box add to your blog | This will allow your visitor to attract your page directly to your blog. ❤Enter a post that will become viral on Facebook only. For this, use images in your post. ❤Make the introduction of your page interesting, so that the user should then like your page. Post on time when people are more active on Facebook. People are more active on Facebook between 1 AM and 8 PM, posting on this time will get more likes on your page and posts. Facebook has thousands of millions of groups, which have millions of members. Through Facebook groups, you can reach your post to as many people as possible. First, join more and more Groups related to your blog's niche. And share all your posts with the link there. The more members in the group, the better it is to traffic your blog. Have social share buttons right below all the posts in your blog. By doing this, if your visitor likes your post, he can share it directly with the same person. By doing so, his friends will also know about your blog. And this will increase traffic to your blog. If you want to increase traffic on your blog and you can spend money for it. So for this, facebook advert is a best choice. Through Advert, you can promote your blog on Facebook, also in good price. facebook will promote your blog ahead of those people who can get good traffic to your blog. To advertise on facebook, you can go to the home page of your facebook account and go to the right of the drop down sign by clicking on the advertisement. These were the ways Facebook used to bring traffic to your blog. His traffic is very important for any blog. The success of any blog is estimated by its traffic. 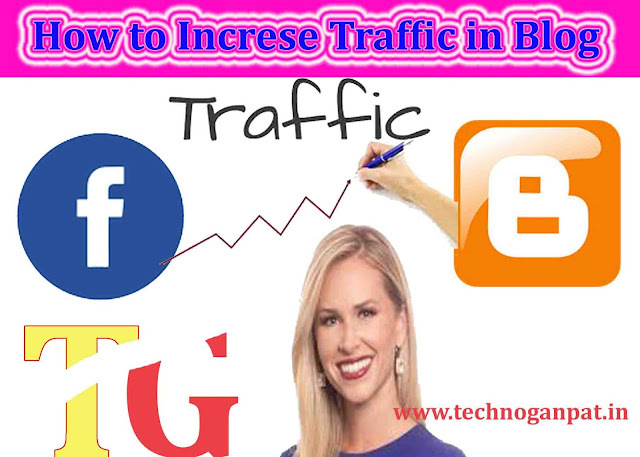 Therefore, you should emphasize on increasing the traffic of your blog. You can read this post for this - How to increase traffic to your blog. You must give your feedback on this post. If you like the post then share it with your friends.